Sisters from Guatemala seeking asylum, cross a bridge to a port of entry in to the United States from Matamoros, Mexico, in Brownsville, Texas. Across the southwest border, immigration lawyers say they're seeing an alarming jump in the number of asylum-seekers turned away at the earliest stage of the process — what's known as the credible fear interview. "That was shocking to have received a negative credible fear result," said Linda Rivas, the executive director of the Las Americas Immigrant Advocacy Center in El Paso, which is representing Lourdes and other asylum-seekers. For now, Lourdes is being detained by U.S. Immigration and Customs Enforcement at its facility in El Paso. We're not using her full name because she's afraid the gang might find her again. Back in 2012, Lourdes says, she owned a small clothing store in Honduras. A local gang tried to extort money from her — money she didn't have. "Four people came into my store, with their faces covered," Lourdes said. They beat her, and burned her arm with acid, she said, and damaged her left hand so severely that four fingers had to be amputated. Lourdes says she reported the incident to the police in Honduras, but they never followed up. She went into hiding for five years, she says. But when she went home to visit her mother the gang found her and threatened to kill her. That's when she decided to flee to the U.S. In the past, immigration lawyers say, Lourdes and others fleeing gang or domestic violence would likely have passed this first interview — and gone on to present their cases, eventually, to an immigration judge. But those odds have changed. "Even people with pretty severe issues having happened to them in their home country are still coming up with negative 'credible fear' results," Rivas said. Immigration lawyers say they've noted a shift starting last month, when Attorney General Jeff Sessions issued a sweeping decision that reshapes who can qualify for asylum. That decision was reinforced last week with concrete guidance to asylum officers, directing them to reject more claims based on "private crime"-- in particular, domestic abuse or gang violence. Immigrants' rights advocates say credible fear interviews can be a matter of life and death. "The consequences are dire for people who are turned around," says Eleanor Acer, senior director for refugee protection at Human Rights First. "These people will be returned to persecution without even having the chance to have their claims for asylum assessed in U.S. immigration courts." Until recently, three out of four asylum-seekers were passing the credible fear screening. That's too many, according to the Trump administration. "The statutory standard for credible fear screenings at the border has been set so low that nearly everyone meets it," said L. Francis Cissna, the director of U.S. Citizenship and Immigration Services, which oversees asylum officers. USCIS declined our request for an interview. But Cissna testified before Congress in May that many immigrants are exploiting the asylum system to get into the U.S. And the backlog of more than 300,000 asylum cases means it's often years before they get to court. "Many of those seeking to enter this country illegally and the smuggling organizations who profit from them know that a few key words are all it takes to get an alien through this screening process," Cissna said at the hearing. Immigrant rights' advocates argue that the Trump administration's tougher guidelines means legitimate asylum-seekers are being rejected as well. They're also concerned that the new guidelines explicitly instruct asylum officers to consider whether an immigrant crossed the border illegally before making their asylum claim. That's likely to be challenged in court, said Eleanor Acer with Human Rights First. "But for people who are summarily deported," Acer said, "their fates will be sealed already." That may include many of the parents that the Trump administration separated from their children. A federal judge in California has ordered the government to reunite those families by July 26th. But immigration lawyers fear many of those families will be quickly deported back to their home countries. In its latest update to the court, the government said that 863 parents awaiting reunification already have a final order of removal. 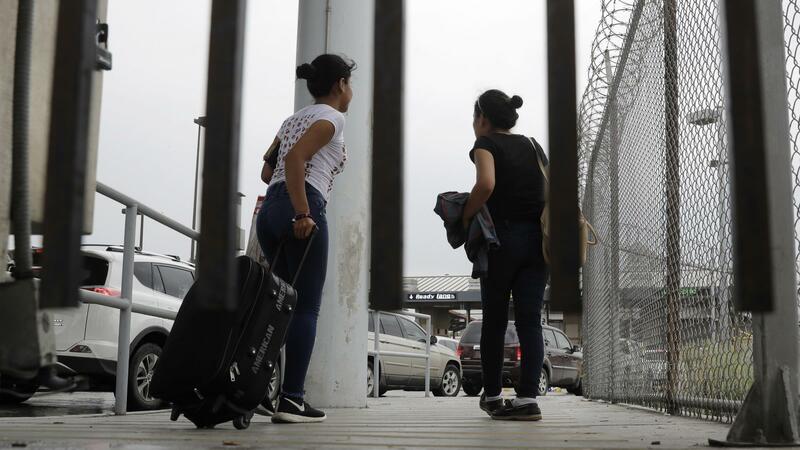 "The Trump administration is trying to send a message to asylum seekers," said Carlos Moctezuma Garcia, an immigration lawyer in McAllen, Texas. "Perhaps we will reunify you. But we'll reunify you on the plane back to your home country, without allowing you to present your full case before an immigration judge," Garcia said. Garcia says he recently visited the ICE facility in Port Isabel, Texas, where some of his clients are detained. Out of 76 women in the cell block, Garcia says, his clients told him that only 8 had passed the credible fear screening. "Which to me seems like an insanely low number," said Garcia. "Overwhelmingly, I believe that people are being denied." In El Paso, Lourdes has received a final deportation order. Her lawyers have appealed. She says she's terrified of going to back to Honduras because she's afraid the gang will find her again, and kill her. "I was hoping that the U.S. would give me the opportunity to live with dignity," she said. "I'm not asking for anything else." Thousands of people arrive at the U.S.-Mexico border every month seeking asylum. And those claims have become much harder to win. More and more immigrants are being turned away at the first stage of the asylum process. NPR's Joel Rose has this report. And a warning - this story contains some graphic details of violence. JOEL ROSE, BYLINE: Lourdes owned a clothing store in Honduras. She says a gang there tried to extort money from her, money she didn't have. That's when her life changed dramatically. ROSE: "Four people came into my store," she says. They beat her, burned her arm with acid and damaged her left hand so severely that she lost four fingers. ROSE: We spoke to Lourdes on a bad phone line from an immigration detention center in El Paso, Texas. We're not using her full name because she's afraid the gang might find her again. Lourdes fled Honduras earlier this year. She walked across the bridge from Mexico to El Paso and requested asylum. The first step is what's known as a credible fear interview with an asylum officer. ROSE: "I told him that I have the evidence on me," she says. She told him about the scar on her arm and the missing fingers. But the asylum officer rejected her claim. ROSE: "I don't know what happened," Lourdes says. "I don't know how I failed." Her lawyers are surprised by the outcome too. LINDA RIVAS: That was shocking to have received a negative credible fear result. ROSE: Linda Rivas directs the Las Americas Immigrant Advocacy Center in El Paso. In the past, Rivas says Lourdes and others fleeing gang or domestic violence would likely have passed this first interview and gone on to present their cases eventually to an immigration judge. But Rivas says those odds have changed. RIVAS: Even people with pretty severe issues having happened to them in their home country are still coming up with negative credible fear results. ROSE: Immigrant advocates across the southwest border say they've seen a sudden shift starting last month, when attorney general Jeff Sessions issued a sweeping decision that reshapes who can qualify for asylum. That decision was reinforced last week with concrete guidance to asylum officers directing them to reject more claims, especially those that are based on domestic abuse or gang violence. Eleanor Acer with Human Rights First says credible fear interviews can be a matter of life and death. ELEANOR ACER: These people will be returned to persecution without even having the chance to have their claims for asylum assessed in U.S. immigration courts. ROSE: Until recently, 3 out of 4 asylum-seekers were passing the credible fear screening. That's too many, according to the Trump administration. L FRANCIS CISSNA: The statutory standard for credible fear screenings at the border has been set so low that nearly everyone meets it. ROSE: That's Francis Cissna, the director of U.S. Citizenship and Immigration Services, the agency that oversees asylum officers. The agency declined our request for an interview. But Cissna testified before Congress in May that many immigrants are exploiting the asylum system. And the backlog of more than 300,000 asylum claims means it's often years before they get to court. CISSNA: Many of those seeking to enter this country illegally, and the smuggling organizations who profit from them, know that a few key words are all it takes to get an alien through this screening process. ROSE: Immigrant rights advocates argue that the Trump administration's tougher guidelines are rejecting legitimate asylum-seekers too. They're likely to challenge the new guidelines in court. But that won't help people who are trying to make asylum claims now. ROSE: In El Paso, Lourdes has received a final deportation order. She says she's terrified of going back to Honduras. "I was hoping that the U.S. would give me the opportunity to live with dignity," she said. "I'm not asking for anything else." Joel Rose, NPR News. Transcript provided by NPR, Copyright NPR.